China’s rapid economic development has had serious consequences on the environment and on public health. China is now home to 16 of the 20 cities with the highest pollution in the planet. China’s widespread use and abuse of natural resources has depleted them and contaminated the environment. Measures must be taken to avoid irreversible consequences of development on the health of the Chinese people. China is the second-largest country in the world by land area, has long had the fastest growing economy and is now the second-largest economy in the world measured by GDP. However, China is only in 87th place in terms of GDP per capita. This fact underscores the huge disparities that still exist in the country — inequities which Mao Zedong’s revolution was supposed to eliminate forever. A sample of these disparities is the consumption of some items that were considered luxury in the country: Car production is estimated to increase by 30%, reaching $200 billion in the coming years. And in Beijing, one in four people has a car. There are an estimated total of over five million cars in the Chinese capital. China’s rapid economic development has had serious consequences on the environment and on the health of its population. The country is now home to 16 of the 20 cities with the highest pollution in the planet, and is thought to be second, globally, in carbon dioxide emissions. 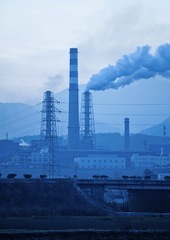 Air pollution in major Chinese cities is considerable. This is due not only to toxic emissions from cars, but also to the burning of coal as a source of highly polluting energy. Air and water pollution affect everyone but especially children and the elderly. Children are particularly susceptible because their immune system and detoxification systems are not fully developed. Moreover, China has only 7% of arable land, which decreases at a rate of one million hectares per year because of the rapid increase in urbanization. As a result, the country must import large quantity of grains such as soybeans and wheat and other commodities like copper, aluminum, cement and oil. China’s economic reforms have benefited millions of people, improving their quality of life. Paradoxically, the widespread use and abuse of natural resources has depleted them and contaminated the environment. In northern China, for example, severe pollution has cut life expectancy down by five and a half years. This is the result of policies from the 1950s to provide free heating by coal burning which significantly increased pollution levels, particularly in cities north of the Huai River, mid-way between the Yellow River and the Yangtze River, the two largest rivers in China. Since the 1970s, it has been known that high pollution levels negatively affect cardiovascular and respiratory health, increasing the risk of early death from heart and lung diseases. Research carried out in the last decade shows that high air pollution levels may cause damage to children’s cognitive abilities, risk cognitive decline in adults and contribute to depression and perhaps even to dementia, which is often preceded by a long period of cognitive decline. China’s economic development in the last decades has been remarkable. New measures need to be taken, however, to avoid some serious, irreversible consequences of that development on the health and well being of the Chinese people.